Crafting movies around theme park rides is a rather risky creative proposition. For every Pirates of the Caribbean mega-franchise, there’s a Haunted Mansion. Theme park rides are more locations then they are stories, so it’s an adaptation where there’s nothing really to adapt except for a setting starting point. Tomorrowland has a few nods to its spiritual source material, but it’s an original science fiction film with much on its mind beyond entertainment. With Brad Bird (Mission: Impossible Ghost Protocol, The Iron Giant) turning down the new Star Wars to make Tomorrowland, I had definite expectations. Bird hasn’t made a bad movie yet. 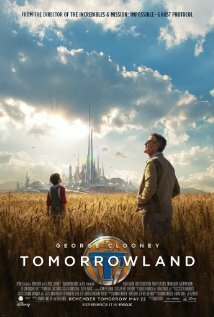 He still hasn’t but Tomorrowland is definitely the worst film in Brad Bird’s heretofore-unshakable pedigree. Casey (Britt Robertson) is a dreamer with a capital D. While her teachers bemoan the cataclysmic shape of world events and instability, she doggedly raises her hand to ask, “Yeah, but what can we do to fix it?” Her father works for NASA but the nation has lost interest in space and has stopped looking at the stars. Casey sneaks out every week to thwart the demolition of a NASA launch platform. She can’t let it go. She comes across a mysterious pin that, when touched, transports her to a hidden world, a future city called Tomorrowland. But there are others that are looking for this city too. A slew of androids chases after her to retrieve the pin. Robot child Athena (Raffey Cassidy) becomes a protector for Casey and the two set off to find Frank (George Clooney), a hermit and mechanical mastermind who once lived at Tomorrowland before becoming disillusioned. This is one of the few movies where the more characters explained the plot the more confused I ultimately became. The story by Bird, Damon Lindeloff (Prometheus, HBO’s The Leftovers) and Jeff Jensen doesn’t exactly a clear narrative, and that begins with the structure, inserting two framing devices that are too cute for the movie. The first 15 minutes is Frank’s childhood experience discovering Tomorrowland, and this is probably because we won’t see Clooney’s grown-up Frank until an hour into the movie. It takes far too long to get going, instead becoming a series of unnecessary plot detours, like a trip to a collectibles store in Austin or a trip to the Eiffel Tower. Is there a reason that a return to Tomorrowland is saved for the very end of its final act? Probably because utopias are boring, which the movie itself admits and admonishes us for accepting. You see, dear reader, it’s all of us and our collective negativity poisoning the planet. Our use of cynicism and our love of dystopias in movies and literature are to blame. In this proclamation, a movie as madly genius as Mad Max: Fury Road is leading to the downward spiral of humanity, and nobody who sees that brilliant film could accept that. Tomorrowland has some legitimate points, precisely aimed at the inconvenience of action over the convenience of stasis. In one of the better articulations of its shiny happy message, a character says that people accept the worst because “they don’t have to do anything today.” It’s the global equivalent of, “I’ll start my homework tomorrow,” knowing we’ll probably never get around to it, to our own detriment. Tomorrowland’s idealism would be easier to swallow if it wasn’t so oppressively scolding. First, allow me to reject its notion that popular culture wallows in darkness and there is no inherent value with this predisposition. If this was true then no one would read the wealth of Russian literature, which is reams and reams of pages of suffering, unrequited longing, confusion, anxiety, pressure, and finding what grace one can. One of Casey’s teachers upholds George Orwell’s 1984 as a living testament to what we’re going through today, but Orwell’s novel isn’t popular or well revered just because it’s desolate. Would millions of readers be foolish for finding something powerful and poignant in Cormac McCarthy’s award-winning dystopian cannibal road trip, The Road? Just because one is optimistic doesn’t mean you’re in the right, and just because one is pessimistic it doesn’t mean you’re in the wrong. Perhaps the culture is too hesitant to take necessary action because it’s easier to buy into the argument that our actions are meaningless; hence why the newest argument against environmental reforms to curb the effects of climate change amount to, “Yeah, but what difference will it make now?” If Tomorrowland was trying to rouse its audience into action, it went about it the wrong way. The movie’s tone is far too scolding and stuck on can-do platitudes to be anything beyond an earnest motivational poster that will ultimately be ignored. Then there’s the film’s restricted view on what constitutes the Right Dreams. Casey refuses to allow the NASA launch station to be demolished because it supplies her dad with a job, but really it comes down to her idealism of man’s capacity to achieve. And yet, her chosen way of expressing this, besides general perkiness, is to cling to an older definition of what constitutes achievement. The space shuttles were grand but we’ve outgrown them and space travel itself has migrated into the private sector. Just because U.S. astronauts aren’t being launched into space with the frequency they once were, does that means the country has somehow lost its ideals? Or are we allowed to adapt to the demands of the times? Strangely, Tomorrowland holds onto a retro definition of what constitutes achievement, something also touched upon in Interstellar, where Matthew McConaughey shook his McConaugh-fist at all these young kids for not having the same level of interest in the old technologies and pursuits. Tomorrowland fixates on the scientific dreams of the 1960s, but that’s no longer a representation of our world. What it ends up pining for is a throwback to Disney’s own era of gee-whiz futurism, a world where flying cars are valued above, say, the Internet. 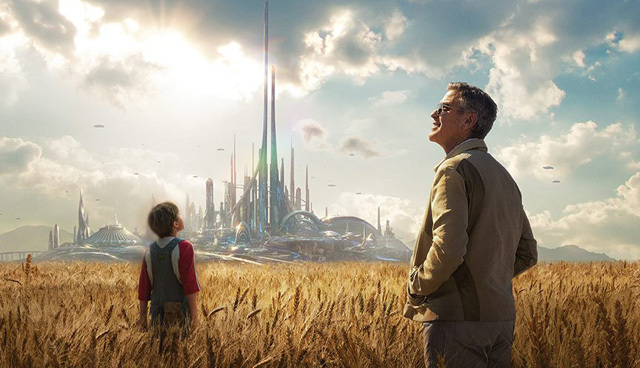 If you think about it, Tomorrowland’s utopia is pretty much a progressive version of Ayn Rand’s Atlas Shrugged. In Rand’s famous ideological tome, the “best and brightest” (a.k.a. rich industrialists) decide they’ve had enough with the common man getting in their way, and so they up and leave and start their own secret paradise where they won’t be disturbed by the likes of us “normies.” With Tomorrowland, it’s not the business types who take their ball and go home but the inventors, scientists, and artists, the creative class, who are given magic passage to a hidden world where their work will be undisturbed by those deemed less creative and/or essential. It’s intended to be inspirational but it awkwardly falls into a murky class-consciousness it can’t escape. Who defines the value of creativity exactly? Is there a Tomorrowland board of directors that says, “You know what, we definitely need that guitar player. Forget having plumbers.” Are the day-to-day laborers and paper-pushers, the ordinary people that keep the infrastructure of the world running, are they just deemed less significant? Tomorrowland apparently only has the best and brightest when it comes to all things, including the people that take out your garbage and unclog your sinks. Are the gravediggers the finest from around the world? Is the world’s greatest and most creative gravedigger still a few notches below a rather lackluster environmental scientist? As you can see, it invites all sorts of questions that will go unanswered because, again, the film’s message is everything, and the particulars of its invite-only exclusive society are off limits. The action sequences are also strangely dull for a filmmaker such as Bird. Each sequence has its moments of inventive orchestration, especially a brawl in the sci-fi collectible shop that squeezes in lots of homage. Too often the action is missing the creative spark Bird has showed in so many of his past films, particularly 2004’s The Incredibles. The mayhem is also a little too intense for younger children, especially with real people being so callously zapped into dust out in the open (not exactly keeping a low profile, robot henchmen). There’s also a child robot who factors into a lot of the peril, and then very uncomfortably into a late scene where she expresses her love for the grown-up Frank. I understand they had a connection when they were kids but the movie still ends with Clooney cradling a child in his arms and talking what could have been their tale of romantic love. It’s just a little creepier than affecting. Speaking of which, are children going to be entertained by something this message-laden and obtuse in plot? Are adults going to be entertained with this movie? Who is this movie actually for? The saving grace of Tomorrowland is the performance of its plucky heroine played by Robertson (The Longest Ride, TV’s Under the Dome). She’s got great presence on screen and a naturally charm that is far less oppressive than the material she’s delivering. Clooney (The Monuments Men) is his standard appealing, handsome, wounded leading man, and it’s a mistake to hold his character out of the action for so long. When George Clooney is on the poster for your big-budget sci-fi movie about the power of dreamers, you shouldn’t wait a whole hour to get around to his character. Magnifying this problem is the fact that the narrative has so few characters who actually matter, mainly four, and one of them isn’t significant until an hour in and another isn’t until the very final act. Tomorrowland is a sincere, hopeful, and idealistic film that shoves its message in your face and doesn’t offer much in the way of an alternative besides, “Do better.” The problem is that this message of hope and agency is lost amidst a plot that is swallowed whole by near-constant exposition, a clunky framing device, and a world-destroying scheme that seems horribly convoluted in a manner unfitting for the supposed smarty-pants antagonists. It’s simply not a very good story, not told in a very good way, and a message that needs to go beyond a simplistic slogan to be more inspirational. It’s a pretty film with some fun moments, but Tomorrowland is a reminder that not all nostalgia is credible, not all dreams are equal, and messages are digested better when the audience cares about what is happening and (key point here) understands it. Me? I’ll prefer going to see Mad Max: Fury Road again, but that’s just me dooming humanity. Worth it. Posted on May 31, 2015, in 2015 Movies and tagged action, brad bird, britt robertson, disney, drama, dystopia, george clooney, hugh laurie, judy greer, katherine hahn, keegan michael-key, robots, sci-fi. Bookmark the permalink. Leave a comment.